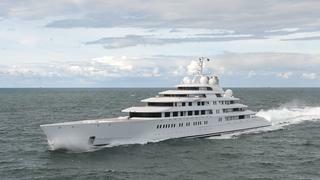 Azzam is the world's largest superyacht, launched in 2013 by Lürssen Yachts, which has been involved in the building of six out of the top 10 largest yachts in the world. Not much is known about this behemoth of a yacht other than the basic specification and that her interior is in a relaxed French Empire style, but she is rumoured to have been built for the a member of the royal family of Abu Dhabi of the United Arab Emirates. The technical engineering was directed by Mubarak Saad al Ahbabi for the owner. She has an impressive speed due to her innovative water-jet propulsion system (two fixed jets, two directional), which catapults this 180 metre yacht to a staggering top speed of 31.5 knots.